Franchise To Open Computer Center, ABCSA,Computer Franchise, Free Franchise: How To Make Money Off line ? How To Make Money Off line ? Are you unemployed and wan to make money, Do you want to start any work from your home, are you in search of a work which will make your life smooth. Do you want to enter in education industry then yes, this is the right place. Akhil Bhartiya Computer Siksha Abhiyan is providing an opportunities for the people of India or job seekers to start there own ISO CERTIFIED Computer Centre in a very low investment. You can start this work from your village, tehsil, city easily. This will be the most easy work where you can get the opportunity to learn and earn life long. 2. You will be a part of an ISO Certified Institution. 3. You will be able to run your own centre under the brand name of Akhil Bhartiya Computer Siksha abhiyan. 4. You will be able to earn from the first day. 5. Any one can take this franchisee such as house wife, retired person, employed persons, unemployed persons. 6. There will be no target. 7. Unlimited Income as per your work. 8. You will get a start up kit to start your centre. 9. You will be able to run all the courses of ABCSA in your centre. So don't miss the opportunity to make money offline by opening a computer centre. This will change your life. Be an entrepreneur in a very low investment. Make money from home, make money part time, make money full time, open computer center and enjoy the life. 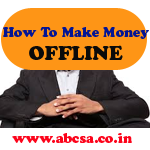 how to make money offline, best home based work, low investment and high return, best work for unemployed persons.